Here is some tiny happy news in this $#%& world. 5ish years ago, I was photographed by Swedish photographer, Albert Wiking and interviewed by Oscar Edlund for a project they’ve been cooking for a long time. The project will finally see light next week and it’s called, ‘We Have A Dream’. It’s a photography exhibition of portraits of 114 people who dared to make a difference; the list includes Dalai lama, Chinese dissident artist Ai Weiwei, Malala Yousafzai, Timbuktu, Chimamanda Ngozi Adichie and I. To be among those names blows my mind! I wish to fly right now to 7aret al Raqas, my humble neighbourhood in Sana’a and tell them the news. I hope my hard-working mother who survived an abusive marriage, and had a 5-year-long fight at courts to win divorce and custody of her two daughters, and worked 24/7 to put food on the table and get us a decent education; I hope my mom is proud of her daughter, moi. I wish my teacher in Sana’a who told me, ‘if you want to be a writer, you’ll die alone, unread and poor,’ know how wrong he was. My dream is that all Yemenis live in dignity and peace, and along with that journey I dream to continue telling their stories. 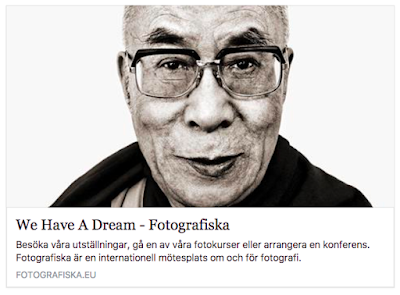 ‘We Have a Dream’ will be exhibited at Fotografiska in Stockholm, 9 Dec - 19 Feb 2017, and will be accompanied by a book of the same name.